I'm probably going to irritate my friend Puck with this entry, so here goes... I think Duffy is a good singles artist. She's got interesting songs that are worth a spin or two. But a full album by her is bound to be a boring experience: I think the interesting voice will become grating when you listen to it non-stop for an hour. 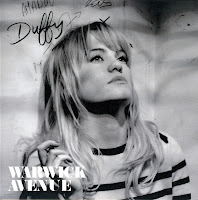 That said, I liked the single 'Warwick avenue' and so I decided to give this one a try as well. 'Stepping stone' is again a nice song. The single peaked at number 21 in the UK singles chart and number 30 in the Netherlands. I'm not wild about the current stream of young women with old hag's voices, like Amy Winehouse, Adele and others. The Welsh singer Duffy could easily be one of them. Fortunately her song 'Warwick Avenue' doesn't get unpleasant like many of her colleagues' tracks. In this age of digital downloads, 'Warwick Avenue' entered the UK singles chart even before it was released on any physical format. It was finally released two months later as the third single from her debut album 'Rockferry'. I heard the track almost weekly on Kim Wilde's current radio programme Secret Songs on Magic FM (UK), and finally decided to buy the 7" single.